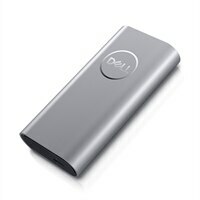 Dell Portable Thunderbolt™ 3 SSD 1TBOne of the world’s fastest portable SSD storage devices, the Dell Portable Thunderbolt™ 3 SSD 1TB lets you backup or transfer all your video, music, photography or other large files at lightning fast speeds up to 2800 MB/second. Small and lightweight, the ultra-portable Dell Portable Thunderbolt ™ 3 SSD is the world’s most compact Thunderbolt 3 storage device. Bus-powered directly from your computer, you’ll be able to edit videos, retouch photography or work with other large files directly off this device when you’re on the go. With a 1TB storage capacity, you’ll be able to store your largest and most important files with room to spare. More Durable: Feature a non-mechanical design of NAND flash mounted on circuit boards, and are more shock resistant. One of the world’s fastest portable SSD storage devices, the Dell Portable Thunderbolt™ 3 SSD 1TB lets you backup or transfer all your video, music, photography or other large files at lightning fast speeds up to 2800 MB/second. Small and lightweight, the ultra-portable Dell Portable Thunderbolt ™ 3 SSD is the world’s most compact Thunderbolt 3 storage device. Bus-powered directly from your computer, you’ll be able to edit videos, retouch photography or work with other large files directly off this device when you’re on the go. With a 1TB storage capacity, you’ll be able to store your largest and most important files with room to spare.